Lately I’ve been a bit obsessed with smoothie bowls (or as I call them, smoodie bowls). The concept is simple and I’ve done it before here and here! But I believe this is my best version yet, and the trick is all in the blending method. This recipe only requires 3 ingredients, 1 blender, and 5 minutes. Huzzah! Simply add frozen bananas and frozen mixed berries to a blender and blend on low (this is key!) until it looks like Dip ‘n’ Dots (remember those?!). Then add a little (not too much!) non-dairy milk of choice – I like coconut – and protein powder if you’d like. Blend some more on low, scraping down the sides until you have SOFT SERVE! 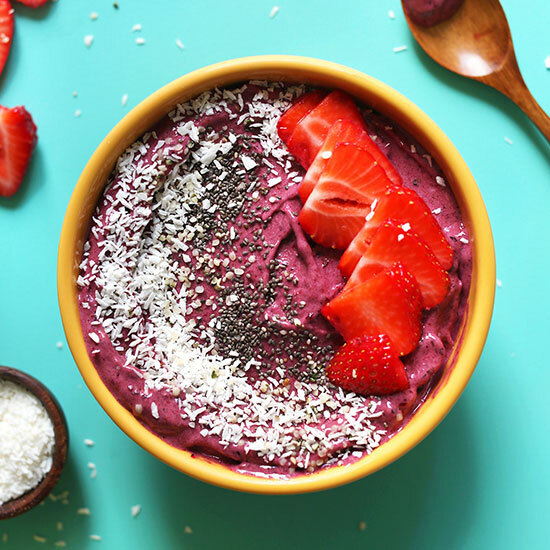 Yes, a smoothie bowl is glorified soft serve and it’s so dang delicious. Hence the reason I can’t stop. The best part about smoothie bowls is the toppings. I’ve been keeping it super simple recently and adding a spoonful each coconut flake, hemp seeds, and chia seeds for added nutrients, fiber, and protein. Fruit makes a pretty addition but isn’t necessary since the entire bowl is made of fruit. This makes the perfect breakfast or snack when you’re in a rush but need something substantial (and want something pretty). It’s especially great for the summer months when we’re all looking for another way to cool down and keep time in the kitchen to a minimum. If you try this bowl, let us know what you think! Leave a comment, rate it, and tag a picture #minimalistbaker on Instagram! 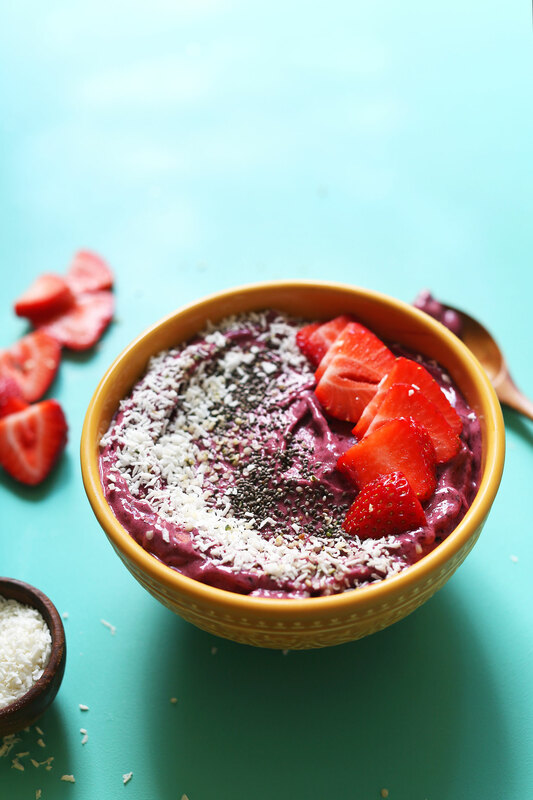 We’d love to see your smoothie bowls in action. Cheers, friends! 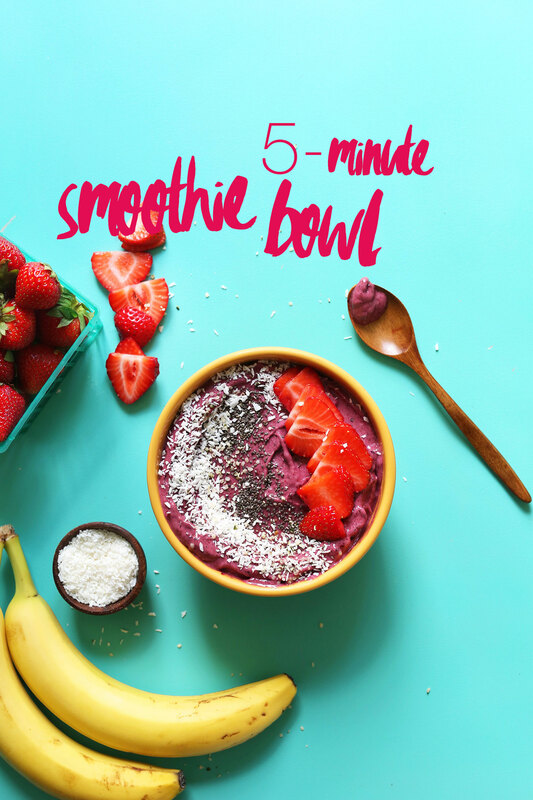 My go-to 5-minute smoothie bowl with just 3 ingredients! Satisfying, nutrient-rich, and naturally sweet! A healthy, plant-based breakfast or snack. Scoop into 1-2 serving bowls (amount as original recipe is written // adjust if altering batch size) and top with desired toppings (optional). I prefer chia seeds, hemp seeds, and coconut, but strawberries, granola, and a nut or seed butter would be great here, too! *I don't love most vegan protein powders but have tried most of these and would recommend them! Aloha Vanilla, Naturade Vegan Vanilla Protein Powder, Sun Warrior Vanilla, Vega Vanilla. *If you're looking for a blender recommendation, check out our shop page! I loved this super easy recipe and how customizable the toppings are (I used coconut flakes, vegan chocolate chips, strawberries, hemp, chia, and flax seeds, peanut butter, and protein powder). I felt full and satisfied all morning into the early afternoon! I ended up putting the almond milk in with the fruit since my blender wasn’t cooperating well with just the frozen fruit, but still ended up with a soft serve texture. So glad you like this, Merilla! Thanks for sharing your modifications! Awesome! Slow-blending really does make a difference! I used banana and raspberries, plus my protein powder, a squirt of lemon, and almond milk. I topped it with chia/hemp seeds and a drizzle of yogurt. It came out so good! This looks delicious! I wanted to make this for breakfast, but it looks like you are using frozen bananas. So, you actually need to prepare for it the night before? Or can you freeze the bananas a couple hours before? Thanks! You can freeze them a couple hours before and that should be fine! Can you use normal milk? Such as lite milk??? I absolutely love and adore you! I am a vegan chef myself, I run my own vegan cafe in Lisbon, Portugal and you are a huge inspiration to me…. I have been playing around with smoothie bowls for a while now and just wanted to ask you do you think in your opinion do the bananas need to be frozen? Or can it just be a normal banana and then frozen berries for example? I have tried both ways and I just don’t want the bowl to be too frozen….. whats your opinion? Thanks again for your amazing work, much vegan love to you. I think both ways work, but we love to use a frozen banana and frozen berries to get a thick consistency but as long as one or the other is frozen, you should be fine! We hope you love it, Luciana! You noted that you don’t love most vegan protein powders…do you mind sharing why? Hi Kandace! Have you checked out our protein powder review? You can find it here! Hello! i was wondering if you could make this with regular skim milk instead of almond/coconut milk? Omg!! I made it this morning for breakfast and it’s delicious. Hands down the best smoothie bowl. You can add whatever you like on top. Thanks it’s amazing ? Woot woot! We are glad you loved it, Christina! I made a blueberry mango smoothie bowl. It doesn’t sound good but is delicious. I put Greek yogurt on top for my protein. If you don’t have protein powder just use Greek yogurt it helps put some tartness in there and gives you protein. Hi! Was wondering if you had any substitutes for the almond milk? This looks perfectly thick, smooth, and delicious! I’m thinking about getting a Blendtec because my nutribullet won’t get my smoothie bowls thick enough to my liking. Mind telling me which model you have? Hi Sarah! We really like this one. Do you have a smoothie bowl cook book out there that I could buy? Hi! We don’t but are glad you enjoy this one! I’m freezing my fruits at the moment so that I can have the smoothie bowl for breakfast tomorrow morning. Just wondering if I can use dairy milk since I am not a vegan? Thank you! I’ve never been able to do a good smoothie bowl. The trick about doing the fruit and slow was just want it needed! You have completely changed my smoothie bowl game ?? Quick question about frozen bananas: do you peel, chop, THEN freeze? Or do you contend with frozen peel…with a mitten and knife? Hi Laura! I recommend slicing up a banana, laying it out on parchment on a baking sheet, freezing and then storing in a resealable freezer bag! i am a vegan newbie… i am very grateful to have found your site as every recipe i’ve made have been absolutely delicious. i’ve shared them with co-workers who are not vegans and they love them too! Love this recipe but it’s a little sour..any advice for helping that??? Hi! Hmm.. It could be the type of frozen berries that you used? One thing I like most about your blog is the colour scheme. Such an inspiration and motivation to eat healthy! 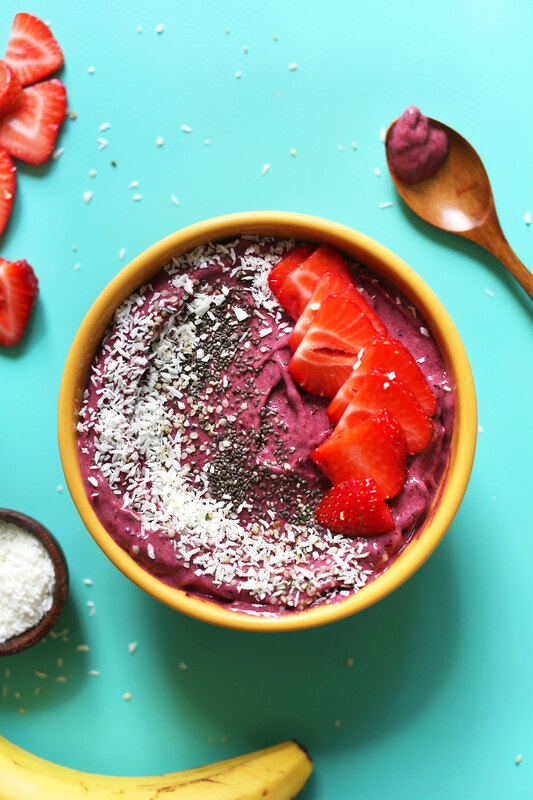 Thank you for sharing the secret of making the perfect consistency smoothie bowl! I have read so many instructions, and never did they say to blend on low and it’s life-changing! So good! 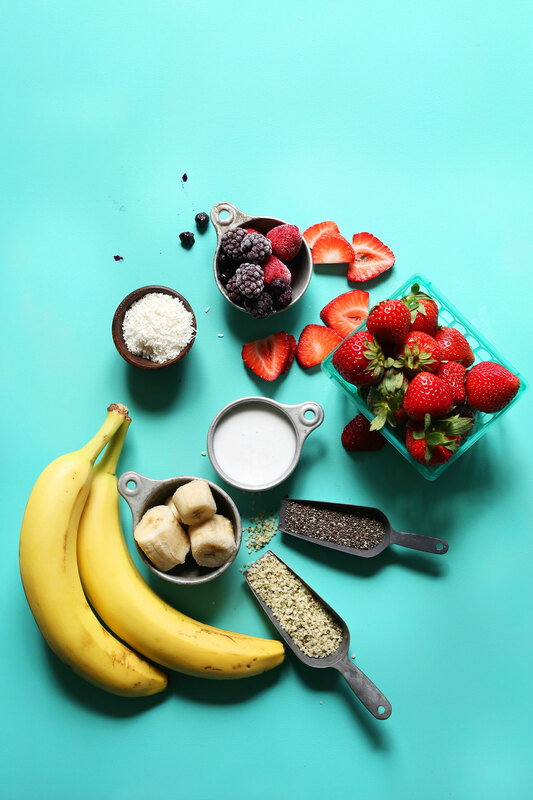 I love the idea of this smoothie bowl, but I have an aversion to the taste of bananas. Ive tried other recipes for smoothies and smoothie bowls which all require bananas but they then end up tasting like banana. Before I go make this and then waste it, does this smoothie bowl taste like banana or am I safe? I don’t know if this tastes like banana, but I read another recipe and it said to freeze under ripe banana’s rather than ripe ones if you want less of a banana flavor. I thought frozen berries would break a blender if there was no liquid? Hmm that has not been our experience with our blender! i made this smoothie bowl after attempting and failing at making one without a recipe. the recipe was so simple and tasty that i made a second one right after! i highly recommend this recipe. Do the chia seeds soften even if added on top & not mixed in? This looks like a beautiful and simple recipe to try out! I was just wondering whether it’s possible to substitute the 2-3 tablespoons of milk with coconut water. Will it make a difference at all? it will not, i used both coconut water and cranberry juice instead of the milk, you might have to add a bit more though. This looks so good! I make a smoothie every morning but didn’t know the tip about doing the frozen fruit first.. WHOOPS. I’m sure tomorrow’s will be even better :) Thanks for the tip! I just made this for the third time for breakfast and it’s super delicious!! Today I added some leftover ‘oat pulp’ from making oat milk and it worked really well, too! It’s much more filling but just as delicious. A friend of mine introduced me to using avocado in my smoothies. Because I’m cutting back on sugar… even natural sugars I often use avocados to replace bananas and add a few drops of liquid stevia. This is a good substitute for bananas. I also use Avocado’s as a base in many of my dressings and sauces. Two years ago I would have never tried such a thing just because I thought I didn’t like avocados. They make things incredibly creamy, they’re nutrient dense with good fats and they really have a very neutral taste. Simple and delicious! The blending on low really made the difference! This is absolutely beautiful, and looks so good! It is a perfect summer snack! Hi! Bananas are great for making smoothies creamy, but I have a banana intolerance… Do you have any suggestions for a substitute that doesn’t add an overwhelming flavor? I prefer my smoothies to be creamy rather than frozen-y. Yes! Freeze almond milk or coconut milk into ice cubes and make that your base! That is a great idea! I am not a big breakfast person but I started eating oatmeal to lower my cholesterol and I do smoothies too. I feel good (not heavy) and ready to start my day. I don’t always have bananas on hand and that sounds like a nice change. I can’t wait to try it. Looks great and I make smoothies, often. Thanks for the vegan protein suggestions. Have you ever tried Garden of Life Raw Protein, a vegan, gluten free, dairy free and soy free protein powder? Yes! It’s my new favorite! Delicious! I’ve heard that adding the liquid from a can of beans actually does a great job at thickening smoothies! Never tried it, but I feel daring! WOW! Another great recipe. I love smoothie bowls. I frequently visit our local Vitality Bowl. They use organic fruit, when in season. A large bowl is about $15 (including tip). This recipe allows control of the quality of the ingred. and you can make it at home very inexpensively. The cost for my smoothie bowl habit is going to go way, way down! I love seeing these wonderful healthy recipes but it bothers me to read unsolicited comments criticizing other posters diets. There are a lot of gurus out there and each person has to do their own research and then make their own decisions. I follow the rules I’ve set for myself and allow everyone else to do the same. I came back to this site to print this and several other recipes. I was surprised, to say the least, at your comment to me. I also love the wonderful recipes on this site. My comment was just that, a comment which was a very big thank you to The Minimalist Baker! I wish to respond as I did NOT NOR did I have ANY intention of criticizing and/or advising ANYONE! I definitely believe and practice the “Live and Let Live” idiom. beginning of this thread, there were comments about a poster’s diet. I felt badly for that person. I messed up in somehow connecting my comment to your lovely post. No problem. Thank you for your response! Sorry for the misunderstanding. your little misunderstanding and subsequent apologies and generalize kindness to each other made my day. ah, the internet needs more of this! Love this recipe, similar to my go-to. Just letting you know, I think your nutritional info is wrong. It says 2.8 g of protein, which would be impossible using any of those protein powders. Very impressive pictures. Wish I could do such amazing pictures of my meals too. Would you mind telling me, which camera you are using? Looks great on me. Smoothie are always awesome, thank you for sharing this quick recipe. When you’re in a hurry and you still can get yourself a smoothie…awesome. Your pictures look delicious by the way! I make smoothies all the time but avoid banana since it tends to make everything taste like banana (surprisingly enough ? )…which isn’t my favorite. Does this recipe taste a lot like banana? The berries overpower the banana flavor! I agree, the bananas aren’t the primary flavor. Use more berries if you’re concerned! I avoid using bananas altogether because it seems I have an intolerance/allergic reaction to them. I use all frozen berries and an acai frozen blend. It tastes great! I see you’re using a Blendtec. What setting do you use to blend on “low”? Are you just using the speed up and down buttons? I just use the speed up and down buttons! If you have it on the lowest speed that should work! Your photos are beautiful!!! We’ve been experimenting more with smoothies this summer. We use a Ninja blender with the motor attachment on top. We simply push down to blend (aka, we don’t have a “low” setting). I’m curious to see if we can get a “soft serve” or not. Just made this for breakfast! It’s so easy and simple to make and tastes delicious! (And it’s healthy, too!) Definitely keeping this recipe! I’m not strictly vegan so breakfasts are usually 5 eggs for me and blueberries. And I’ve been eating that for almost 10 years straight now. So ready for something different!!! Thank you for sharing this. I’m such a creature of habit that it’s hard for me to change boring eating habits.